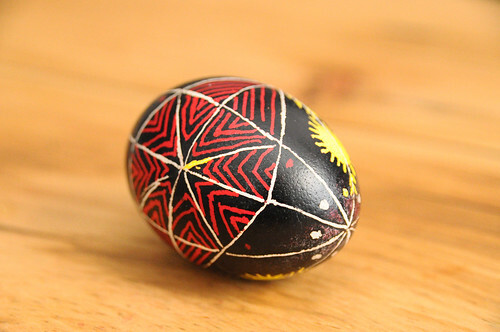 When I think of Ukrainian Easter eggs, I think of intricate patterns in red and yellow on a shell dyed pitch black. Although the art form of pysanky has evolved to include every color, shape and pattern imaginable, I am always taken back so some strange and obscure Sesame Street video about making these beautiful little eggs in black, red and yellow. With Easter weekend right around the corner, it is very tempting to use bead palettes that include plenty of pastels and lush spring color. I thought it would be fun to be a little different, and look at bead triads with deep reds, yellows and black. Although these hues seem more suited to fall than spring, there is an advantage to using them in designs at this time of year. 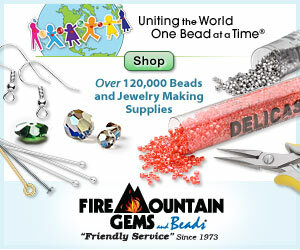 Because the colors are so bold and absorb your gaze, you can use fewer beads to make a big impact. Warmer weather calls for lightweight, easy to wear jewelry, and the heat of summer is closer than we think! So, I went through my bead stash and tried to find creative ways to combine these three colors with beads. I had a really hard time naming the palettes this month, so the titles need some improvement. If any of them inspire you with a fun name, let me know! First we have Midnight Magic. The very first beads I went to were jet black Swarovski rivolis. I can’t think of any other bead that absorbs the light quite like they do. Although they do have the signature Swarovski sparkle and glint, the black is as deep as it gets. For a bezel, I added lemon yellow 15/o’s, and transparent ruby 11/o seed beads. Circus Midnight started with opaque cherry red druks. No matter how I arranged them, I kept seeing clown noses. With black delicas and opaque yellow 8/o seed beads, it’s like a clown costume from some macabre carnival - very Ray Bradbury. Magic Dawn is an all seed bead palette, though the different shapes create new possibilities and room to improvise. I think this palette would make a great spiral rope, with ruby hexes at the core, lustered dandelion 11/o rounds for the base, and matte black magatamas in the middle for texture. Just like bead weaving, decorating eggs in the Ukrainian style is a hobby that many people think requires a great deal of patience and skill. I highly recommend having a browse through some of the beautiful and carefree designs by artists on Flickr. It’s clear that this art form is just as open to interpretation and whimsy as any other - it’s only hard work if you don’t like doing it. I love these Ukranian eggs. My grandfather came to the US from the Ukraine in 1890 so they have always been special to my heart. I would love to see the finished prject from Midnight Magic. I think I have been inspired to make something! I'm glad you've found some inspiration! I do need to use up those rivolis - I'm going to go out on a limb and admit I'll be happy to see them go! Though the black unfoiled ones are my favorites. I am so looking forward to what this becomes. You are not afraid of color and I love that!